Telling the history of Claremore…one story at a time. 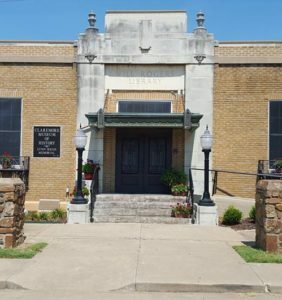 The old Will Rogers Library, located at 4th & Weenonah Avenue, has been completely remodeled and is now the beautiful Claremore Museum of History. A story that appeared in the August 17, 1986 Claremore Progress by Kim Keetch gives the history behind this historic building. With these historic words, via cablegram, from Claremore’s favorite son Will Rogers, the Will Rogers Memorial Library began its first stirrings of life. This Friday, August 15, 1986, the library will celebrate its 50th birthday. It was dedicated August 15, 1936, on the first anniversary of Rogers’ death. It all began in the early 1930s, when a government procurement agent visited Claremore looking for a site for a federal post office. He found a spot he particularly liked and made inquiries. The agent who had the property listed was W. E. Sunday, early-day playmate of Rogers and former Oologah mayor. On this lot the government man was interested in was a garage which had been a livery stable built by Clem Rogers in the early 1900s. After Clem’s death, Rogers bought out the estate and got his father’s properties. Rogers was on his way to Hawaii when the government agent visited. Sunday wired the ship and Rogers replied with his now-famous cable. Sunday, banker G. D. Davis and Jesse Bushyhead, physician and cousin, set the price. The figure was sent to Washington and, after some delay, accepted. The price paid was $4,000. The material the agent had reserved was valued at $3,700. Morton B. Harrison. Claremore resident, suggested the money be used to build a new library building. The idea of a library was acceptable to Rogers but he asked it be called the Sequoyah Memorial Library, because Sequoyah had done more than any other man. After Rogers’ death, however, family and Claremore citizens alike agreed to name the structure after him. Plans from the Oklahoma Library Commission were used. The federal government added $11,600 to money available, making it a $20,000 project. The actual building was started February 10, 1936. The government allocated 80 man-months for the project. The actual time it took to build the library was considerably less, a little more than half the time allocated. One of the most unique aspects of the construction was that no “professionals” were used…no bricklayers, no stonemasons, no plasters, no carpenters, no mechanics, no painters. All the men employed came directly from the relief rolls and most were farmers. The beginning salary was $21 a month, the common labor rate. As these men worked and learned and showed talent, they were reclassified as semi-skilled labor with a raise to $30 monthly. Many advanced to the skilled stage, which paid $38 a month. Although faced with buff brick, much of the material from the old Sequoyah garage which formerly stood on the post office site and which was also donated to the city by Rogers, was used in its construction. After construction was completed, J. B. Milam, state banking commissioner and president of a Chelsea and Claremore bank, presented the library with a portrait of Rogers painted by Tulsa artist Roger Kilbourne Lane. Miss Evelyn Kaff, newly appointed librarian, supervised the removal of the library’s 3,400 volumes into the new building, as well as the placement of $845 worth of new stacks and other furniture. Miss Kaff succeeded Jennie Hopkins, who had resigned after 22 years of service. Rogers widow, Betty Rogers of Beverly Hills, California donated two photographs of her late husband to the library in 1937. One of the pictures depicted Rogers with a broad smile and cocked hat, while the other pictures him in a more serious mood. In the cornerstone were placed mementos, symbolic of Rogers’ time, as historical exhibits for future ages. These mementos include copies of local newspapers, pictures of the old high school and the Will Rogers Hotel and the OMA yearbook. The original Claremore library was established in the early 1900s when a family, due to illness, was moving west. They left some book sets and single volumes, and a dentist offered his reception room and bookcases, on the condition that some lady be there every Saturday afternoon to check books in and out. About 1925, two rooms in the city hall were given to the library. From its humble beginnings 50 years ago, the library has grown into a tourist attraction and necessity for Claremore area residents. Of course, if it hadn’t been built, some “old lady” might have a huge cattle ranch by now.